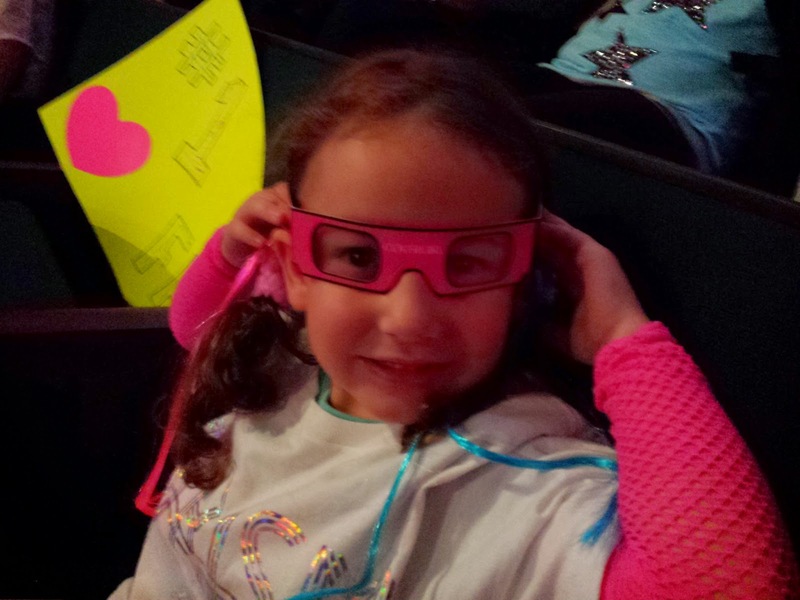 This past Tuesday evening, I took a 5 year old to a Katy Perry concert. Yes. I thought I was crazy too. But then I saw that most of Lane's pre-school classmates were there as well. 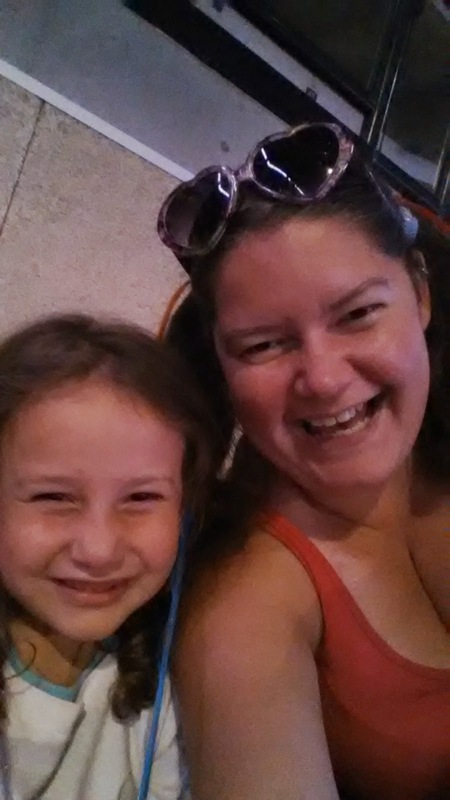 So maybe I wasn't so crazy and possible, just possibly, I'm the coolest mommy EVAR! To get ready for the Katy concert, Lane and I made a trip to Michaels for very sparkly tulle. 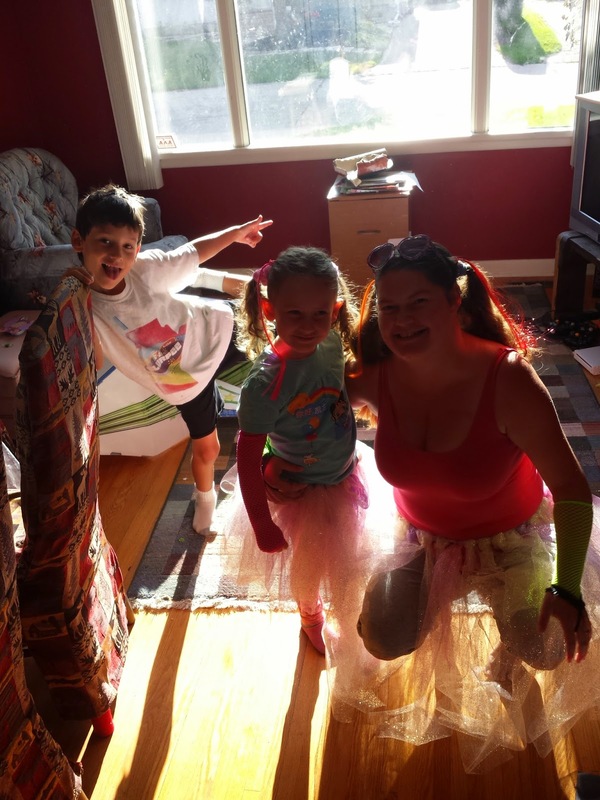 We needed tutus! Pretty! We also made a trip to the Dollar store and ogled over the Halloween aisle. We found some fingerless gloves in neon pink for Lane and neon green for me. And some neon coloured hair extensions as well. 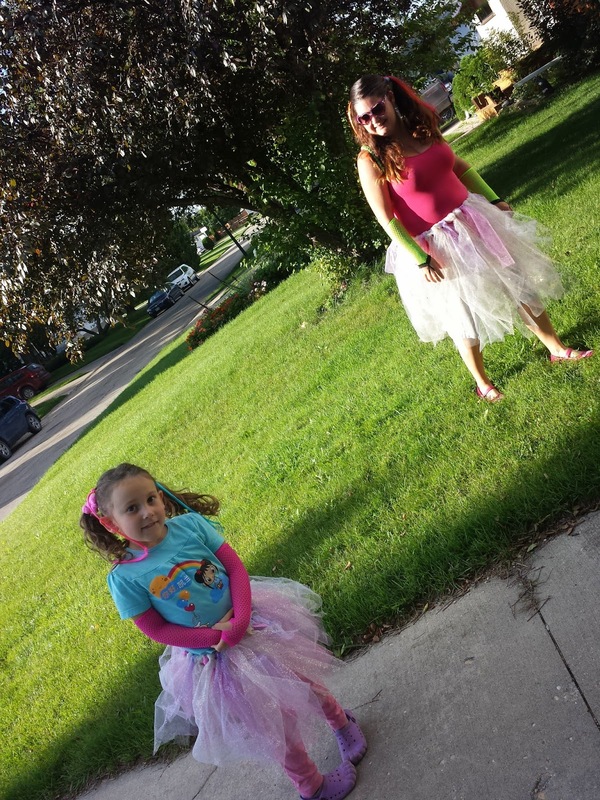 The photos of the tutus were really hard to take. The sun was shining so bright in our living room that they kinda got lost in the glare. (There's Logan photo bombing again). 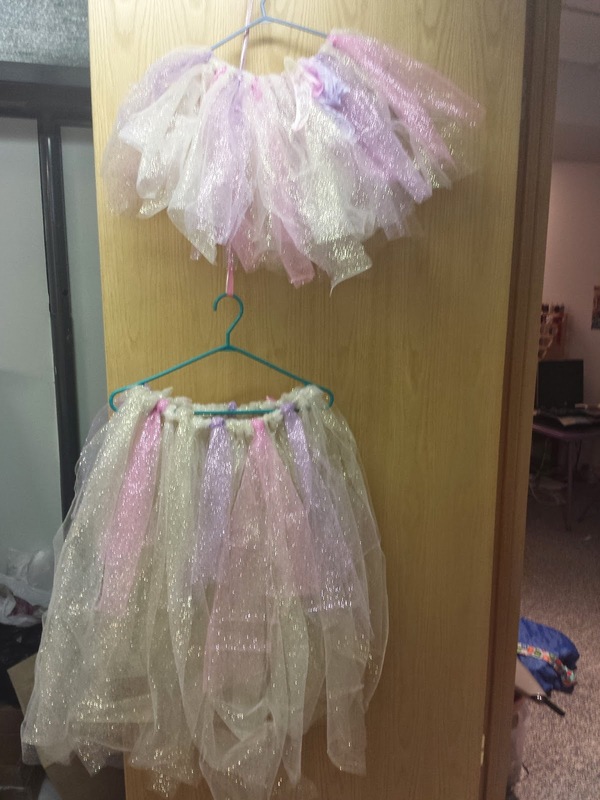 Here is a photo of the tutus after I made them. 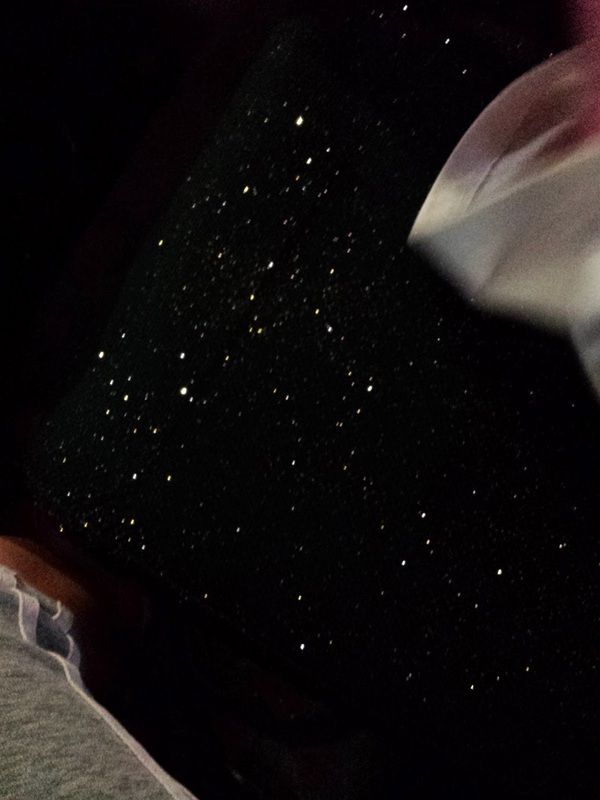 Boy did they shed sparkly glitter EVERYWHERE. I vacuumed and washed and still there is glitter everywhere. 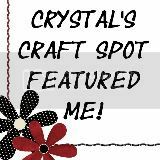 I am finding little bits of glitter on the kids and Terry still and probably will for days and days more. 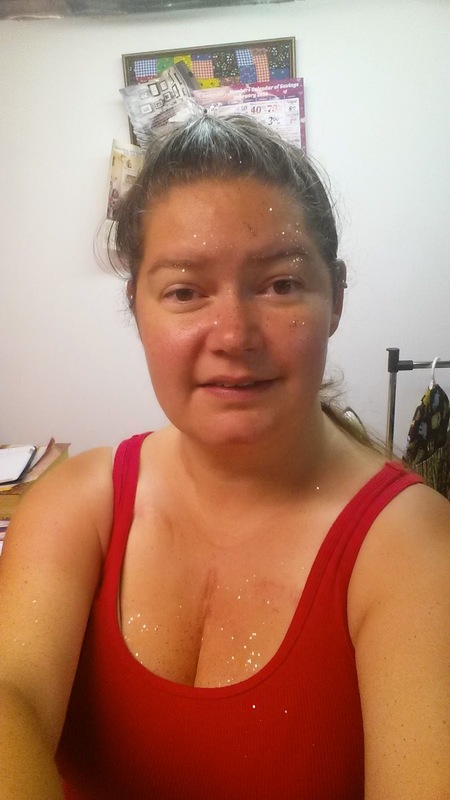 After making the first tutu I was totally covered in the glitter. EEEEEEP!!! MTS Centre didn't know what was going to hit it. 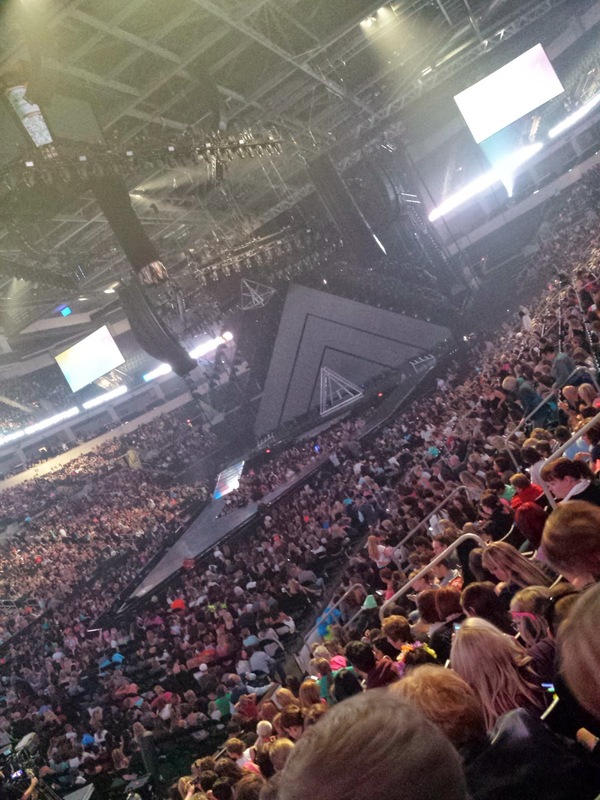 There were so many girls at the concert and so much glitter everywhere. I had to get a photo of our chairs at MTS centre after we sat down. Yipes! And I think there was a Linkin Park concert the next night. I'm sure their fans really appreciated the copious amounts of glitter. But Katy fans sure appreciated our efforts. 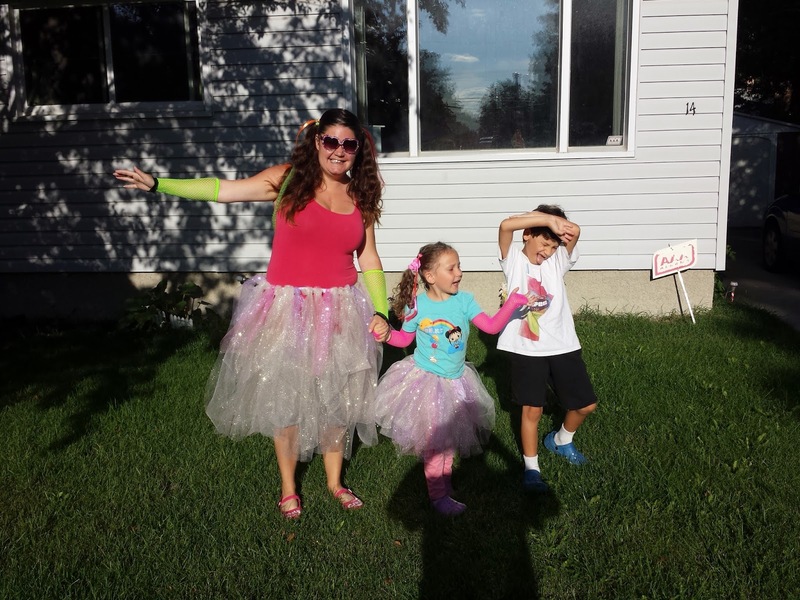 We got tons of compliments on our glitter tutus and saw so many fantastic sparkly costumes. Check out the stage. Pretty cool eh? We stood in line forever and got a t-shirt. 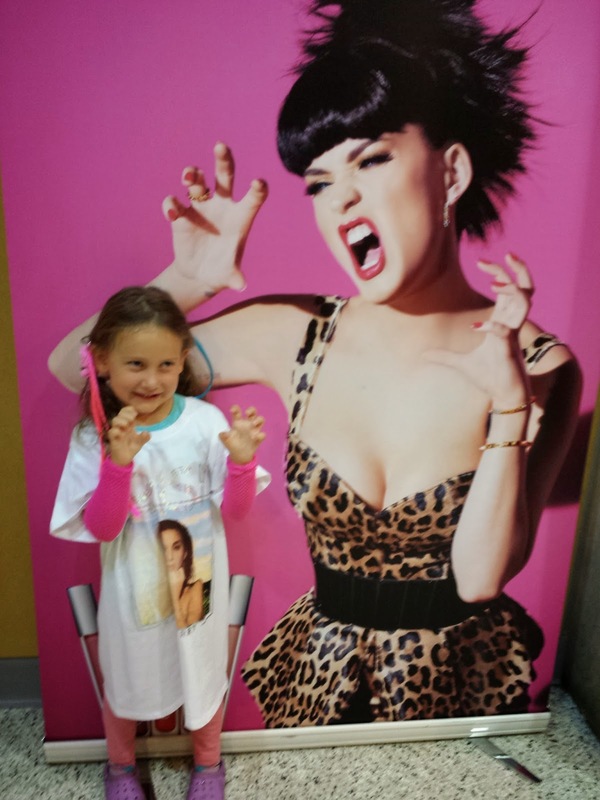 Of course, Lane is little and they didn't have any youth sizes so she now owns a Katy Perry dress. We had taken off our tutus and put them safely in a cloth bag for the concert part. It was too difficult to dance and move around without leaving a trail of sparkles behind us and on everyone around us (including the dad who was obviously there to chaperone 4 teenage girls who was sitting right in front of us). 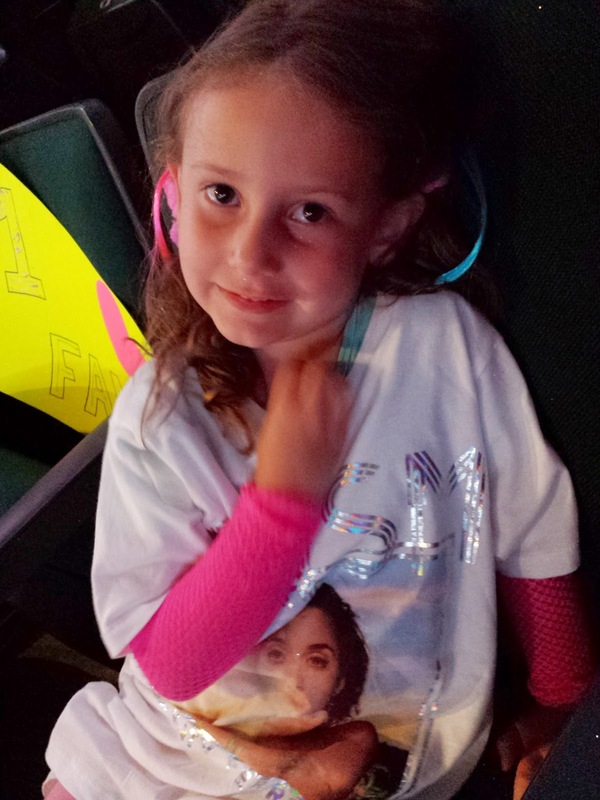 There was a cute tween sitting next to us who had a #1 Fan poster to hold up during the show. Lane thought that was pretty awesome. Actually, I think Lane was enjoying every single moment of her first concert experience. Here is a selfie we took while waiting for Katy to come on stage. They were handing out Prismatic glasses to wear during Firework for an extra special treat. The lights were set up to create a pile of bright, prism-rainbow effects while wearing the glasses. I tried to take a few pics of the concert, but I was never really good at it. I was busy making sure Lane could see, that it wasn't too loud (I brought earplugs for Lane's young ears) and that she wasn't too sick. The poor girl had my cough and really didn't want to miss anything even though she was clearly suffering. We didn't quite make it through the entire concert. Lane was so sleepy and overwhelmed that we decided to duck out early at 10:30. Lane was so happy and it really was a fantastic concert. 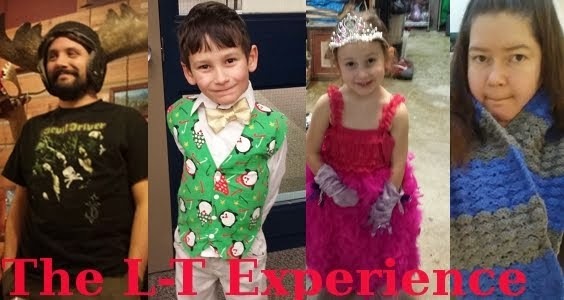 Lots of pretty costume changes, songs that Lane knows all the words to, and circus tricks. Fabulous for Lane's very first concert. Tawny you are the greatest Mom Eva. Looks like you gave your precious little girl a memory to last a lifetime. So jealous you have a little mini-me to share all the girly things in life. My son would probably not go for the tutu.